At long last we get the dudes formerly known as Sun Tzu Sound, now known JUSTICE & TREASURE, down for a visit to our fair Rose City. Original Seattle champions of broken beat and garage from back when, they’re known far and wide for purveying the finest in soulful club sounds with impeccable aplomb. *Plus* we’ll have a special opening set from up and comer E Fury, sublime visuals courtesy of Prism Lab, and well reinforced sound in the place, all to further ensure yall getting fully open on the floor. Bubblin fam, this is going to be a very special evening within the intimate confines of The Rose Bar. Vibery will ensue! Inspired by the beats of West London and cities around the world, Seattle DJs Justice & Treasure have together dedicated more than 30 years to music with soul—from bass to boogie, disco to jazz, house to hiphop. Best known as founding members of SunTzu Sound, Justice & Treasure are fueled by a faithful following in the Northwest and beyond. Their tireless efforts have made them an indispensable mainstay in Seattle, where they regularly book and promote top-shelf international talent and serve as the weekly hosts of Friday night’s City Soul on KBCS 91.3 FM. 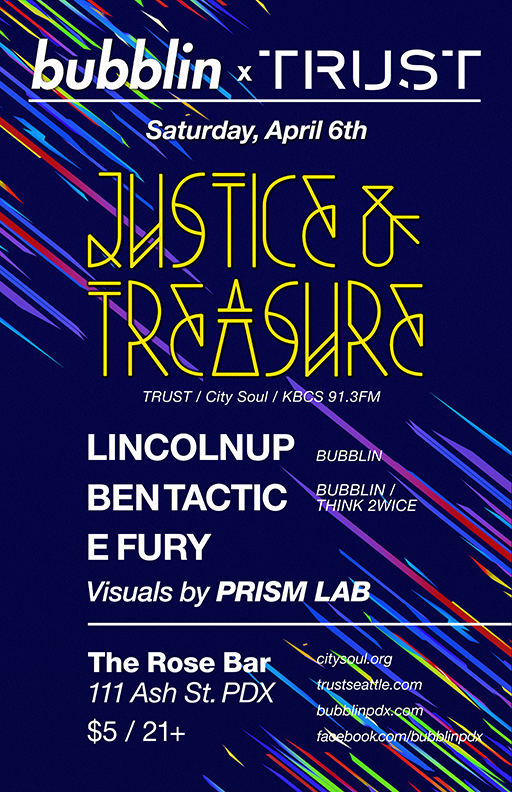 Along with KID HOPS of KEXP 90.3FM, Justice & Treasure are the creators of the monthly dance event TRUST which fans and DJs alike continually call the best dance party in Seattle. This entry was posted on March 29, 2013 at 10:12 am and is filed under Ben Tactic, Bubblin, City Soul, E Fury, Justice & Treasure, Lincolnup, Showtime!, The Rose Bar, TRUST. You can follow any responses to this entry through the RSS 2.0 feed. You can leave a response, or trackback from your own site.